One of the world’s leading darters has taken the chance to brush up on his painting skills – after being inspired by having a colour named after him. 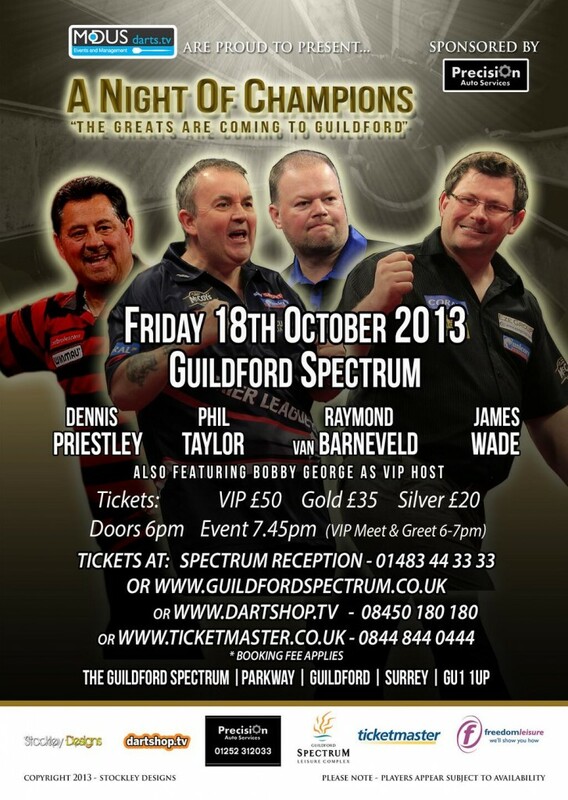 Four of the world’s greatest darts players will lock horns in an exclusive event at the Guildford Spectrum in October. The venue is set to hold its first ever professional darts event when Phil Taylor, Raymond van Barneveld, James Wade and Dennis Priestley appear in ‘A Night of Champions’ on Friday 18 October. The night sees four of the best players on the planet, all of which are major title winners, go head to head, with 16-times World Champion Taylor topping the bill. Taylor or ‘The Power’ is one of the most successful men in any sport and is undisputedly the best darts player ever to pick up an arrow, having dominated the sport for the best two decades. The world number one is joined by perhaps his three biggest challengers historically. Wade has amassed seven major titles, making him the second most successful player in the PDC, while van Barneveld has won the World Championship five times and Priestley twice. And world number four Wade is delighted to be heading to Guildford. He said: “I’m really excited about this event. It is area that hasn’t really been visited by top professional darts player so hopefully we will be well received. “The line-up is fantastic and I’m looking forward to competing on what should be a fantastic night of top quality darts. Tickets for the inaugural ‘A Night of Champions’ at the Guildford Spectrum are available now from the Spectrum reception (01483 443333), www.dartshop.tv (08450 180 180) or from www.ticketmasters.co.uk (0844 844 0444). The PDC’s second most successful player James Wade has agreed a new three-year-deal with leading darts manufacturers Unicorn. The announcement follows Wade’s recent runs to the semi-finals of the World Championship, Premier League and World Matchplay.